You know a story has significance when both the left and right media outlets cover it from the same angle. Over the weekend, both ABC and Fox News covered a "request" from the White House to ignore a law that has obvious political overtones. The WARN Act (Worker Adjustment and Retraining Notification) requires that companies with 100 or more employees give a 60-day notification in advance of plant closings or mass layoffs. This is the law. 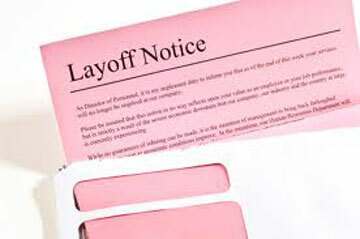 But at the end of September, the Office of Management and Budget (OMB) issued a memo stating that the Department of Labor (who is in charge of administering the law) felt it was "neither necessary nor appropriate" for Federal contractors to pass out layoff notices, due to the "uncertainty about whether sequestration will occur." I know you've heard that word --- sequestration --- a lot in the last weeks, and you may not know exactly what it means. It's a fancy word for "neutering our military." Simply put, if Congress is unable, or unwilling, to reach a compromise on how to solve our trillions of dollars of debt, then nearly half a trillion dollars in mandatory cuts to the Defense Budget over the next decade would automatically go into effect in January 2013 (that amounts to nearly $55 billion in the first year). I will write a future post on the damage that sequestration will do to our military and our national security. But today I want to let you know how sequestration and the destructive cuts to the Defense Budget are being used as political ammunition in this election season. So let's return our focus to the WARN Act. The excuse the OMB gives in their memo for ignoring the law is that sequestration is an unknown factor at this point, and giving notice to laid-off employees at this time would only waste State funds in supplying employment assistance. Their argument is based on the premise that if sequestration can be avoided through compromise, then Defense contractors may not have to lay off as many employees. And we all know that the Federal Government cares so much about the unemployed that they don't want to cause "unnecessary anxiety and uncertainty for workers." But there's a fly in the ointment that makes this memo even more suspect. It's obvious that an employee receiving a 60-day notice this week, might have a bias when they enter the voting booth in less than a month. For me, the particularly heinous aspect to this memo is that government contractors have been promised "that their salary and liability costs will be covered at taxpayer expense if they do not follow the law that requires advance warning to employees of jobs that may be lost due to sequestration." This means that if sequestration occurs in January, and massive layoffs or closings do occur, employees could receive pink slips without adequate notice, reducing their time to appropriately plan for their finances and families. In addition, if the automatic cuts do happen and layoffs occur without the 60-day notice required by law, and contractors are sued by employees for willfully disobeying the law, the Federal Government will cover those legal and liability costs ---- remember: at our expense --- but only if the contractor agrees to follow the memo's guidelines and avoids warning their employees NOW. I guess the thing that really stinks about all this is that the memo doesn't even try very hard to disguise the arm-twisting. I don't see how it could be interpreted as anything less than "authoritative persuasion" in an election year. When the Federal Government can pick and choose which statutes will be enforced and which can be ignored, then we are no longer a citizenry protected by common law. It only follows that all laws will be subject to "new interpretation" or renderings. It just seems so clear to me. When a Government is willing to defy a law, having its own interests in mind, then who is looking out for the People? Why would any law be held sacred? We would do well to remember Thomas Jefferson's admonishment in The Declaration and Protest of Virginia (1825): The greatest calamity which could befall us would be submission to a government of unlimited powers. Jeremiah 8:8 "How can you say, 'We are wise, for we have the law of the LORD,' when actually the lying pen of the scribes has handled it falsely?" Well, you just scared me out of my chair. Gonna be some very pointed questions asked over the next few days...gotta power up the BS-detector and see who's body language tells me what. Yeah, it will be interesting to see if this issue is even brought up in the debates, won't it? I'm beginning to think it's all BS!